A Complete Guide to Fridays Prayers i.e. Salat ul Jumma. Jummah Salah is Fard for Muslims. A Muslim Must not leave the Jummaz namaz for 3 Consecutive weeks .The Most Honourable Prophet Salla Allahu ta'ala 'alayhi wa Sallam said: if a man loses three Jumas without any excuse, Allah Subhanahu wa Ta'ala puts a seal in his mind. In another narration : He throws Islam on his back. Jumma day is a Blessed Day, a day on which Hazrath Adam alayhis 'salam was born and so the Blessed day is know as Eid-ul-Momineen. Its a best practice for all Muslim to wish each other and say "Jumma Mubarak" to one another on this is a blessed Day. Refer Hadiths below for more information of Jumma and its blessings. The Most Honourable Prophet Salla Allahu ta'ala 'alayhi wa Sallam said: Allah Subhanahu wa Ta'ala has made compulsory on you on this day of mine and in this place of mine. Allah Subhanahu wa Ta'ala honoured Islam there with and gave glory to the Muslims. Allah Subhanahu wa Ta'ala says: when there is azan for the prayer on the Jummah day, run towards remembrance of me and give up buy and sale. 1) NIYYAT (intention) is made while saying the takbir at the beggining. It is permissible to make niyyat before that, too. 2) TAHRIMA means to say "Allahu Akbar"
3) QIYAM means to stand. When standing, the two feet must be four finger's width apart from each other. 4) QIRAT: Means to read (recite) by mouth gently. Reading gently means to read only as loud as can hear yourself. It is fard to say an ayat (verse) of the Quran while in Qiyam (standing) in every Rakat and it must be in the order as they are written in the Quran. For example one cannot recite Surah Naas in first rakaat and Surah Ikhlas in second. 5) RUKU: After the sura you bend for Ruku whilst saying takbir. In ruku men open their fingers and put them on their knees. They keep their back and head leveled in ruku. Also the arms and legs must be straight and then you say, "Subhana Rabbiyel Azeem" at least thrice. If the imam raises his head before you have said it three times you must raise your head too. You must not wait to complete the recitation thrice. In Ruku women do not open their fingers, they do not keep their head and back level, nor their arms and legs straight. 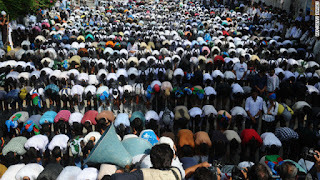 6) SAJDAH (prostration):In sajda, you say, 'Subhana Rabbiyal A'la' at least thrice. In Sajdah, fingers must be closed (no gap in between fingers), pointing towards the qibla in line with the ears, and the head must be between hands. It is fard to put the forehead on something clean, such a clean stone, clean ground, clean wood or clean cloth and it is wajib to put the nose down too. It is not permissible to put only the nose on the ground without a good excuse. It is makruh to put only the forehead on the ground. Thr nose should be pressured enough so that the bone of nose feel the ground, its very important to keep in account when perfoming salat on a soft carpet. "AttahiyyaatuLillahi Was Salawato Wattayyibatu Assalamu Alaika Ayyuhannabi 'o 'Warahmatullahi Wabarka'tuhu Assalamu Alaina Wa'ala'Ibadillahis Sa'liheen, Ash'had'u'un La ilahaillallahu Wa Ash'hadu Anna MuhammadunAbd'uhu Wa Rasooluh', This is known as Tashahhud"
When sitting, men put their left foot flat on the ground with it toes pointing towards the right. They sit on this foot. The right foot should be upright, with the toes touching the ground and bent and pointing towards the qibla. "Allahumma Salleh Ala Sayyidina Muhammadin Wa'ala' Aale Sayyidina Muhammadin Kama Sallaiyta Ala Sayyidina Ibraheema Wa' Ala Aale Sayyidina Ibraheema InnakaHameedum Majeed -Allahumma Baarak Ala Sayyidina Muhammadin Wa' Ala Aale Sayyidina Muhammadin Kama Baarakta Ala Sayyidina Ibraheem Wa' Ala Aale Sayyidina Ibraheema Innaka Hameedum Majeed"
"Allahumag Firii Wali Wale Dayya Wal Ustaad'e Wal Jamee'il Mu'mineena Wal Mu'meenat Wal Muslimeena Wal MuslimatAI'Ahya'eMinhum Wal Amwaat'e Innaka MujeebudDa'waatBirahmatikaYa Ar'hamarr'ahimeen"